Shaking what my mama gave me in this happy little pom pom dress! You know that Ricky Martin song from the 2000s, “shake your bon bon? !” Well literally as soon as I started opening this dress I started singing to myself, “shake your pom pom!” I’ve had it stuck in my head now for three days 🙂 ha! (You’re welcome). But in fashionable seriousness, have you ever seen a happier dress than this one? It’s been raining here for almost a week, so wearing these happy colors brings some much-needed brightness into my day! I have beach plans on Saturday and I have my fingers and toes crossed that this weather clears up so that me and my friends can enjoy! If not, I’m trying to come up with some backup plans asap- any ideas? I shared over on Instagram that I tried zoodles for the first time last week and I absolutely loved them! I made mine with pasta sauce, turkey meatballs, and goat cheese. Super quick and SO tasty! But now that I’m on a zoodle kick I need more recipe ideas. I’d love if you’d share some with me below! Have an awesome Wednesday sweet friends! This is pure sunshine!! These poms, that dress and your e so stinking’ cute!! You’re too kind Andrea! Thank you! I love this dress so, so much! One of my favourite things about your blog is that you continue to post fun, bright colours and prints – I’ve started to notice a lot of bloggers starting to slowly go to more neutral outfits. However, I know I can always rely on checking out your blog for fun, bright prints and colours! I’m so so glad that is my legacy 😉 You can definitely always count on me for bright colors and happy prints! 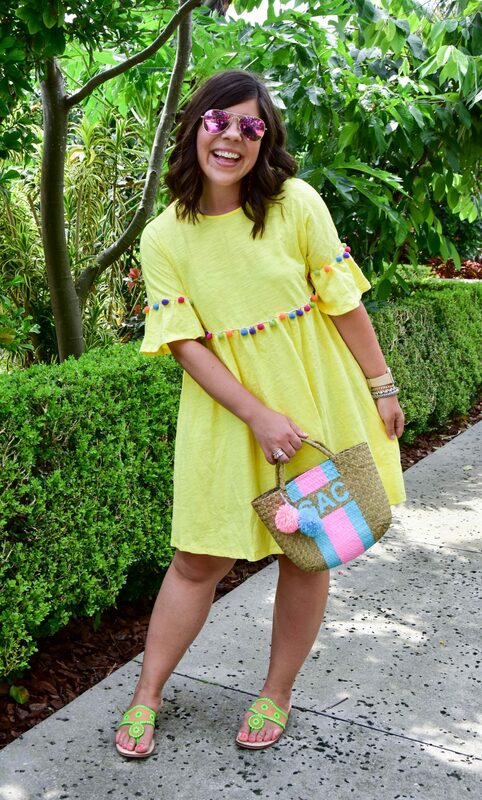 Such a cheerful dress in more than one way – color and the pom poms. You looks super cute! This dress!! We were just talking about a Palm Beach trip in October and now I think I need this dress for it! Yes!! 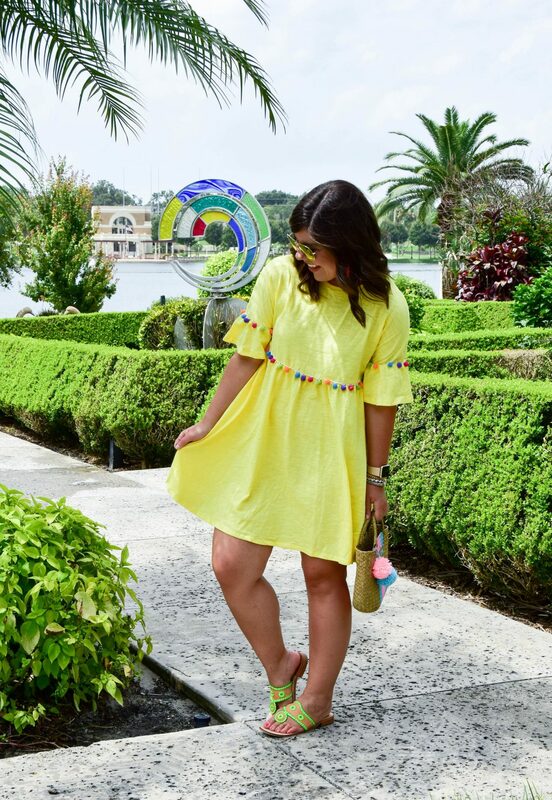 This is definitely the perfect dress for your trip! 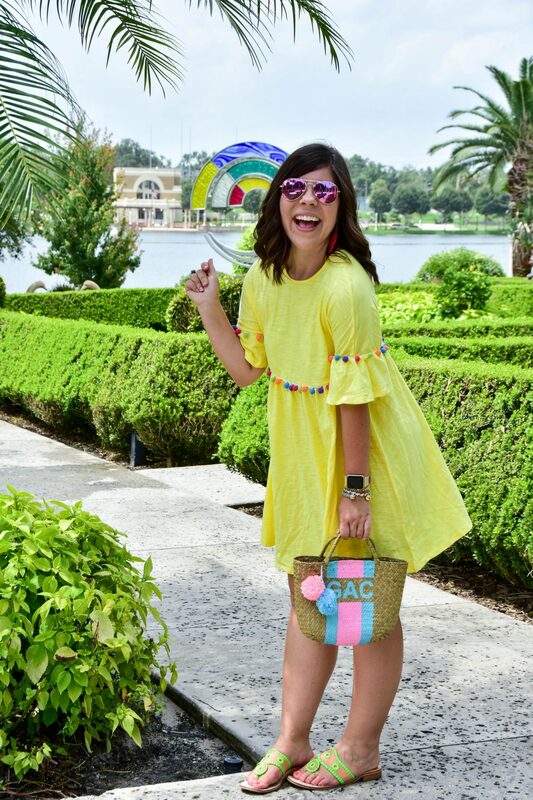 This is like the ideal Florida summer look! So so so cute! You are the cutest!! 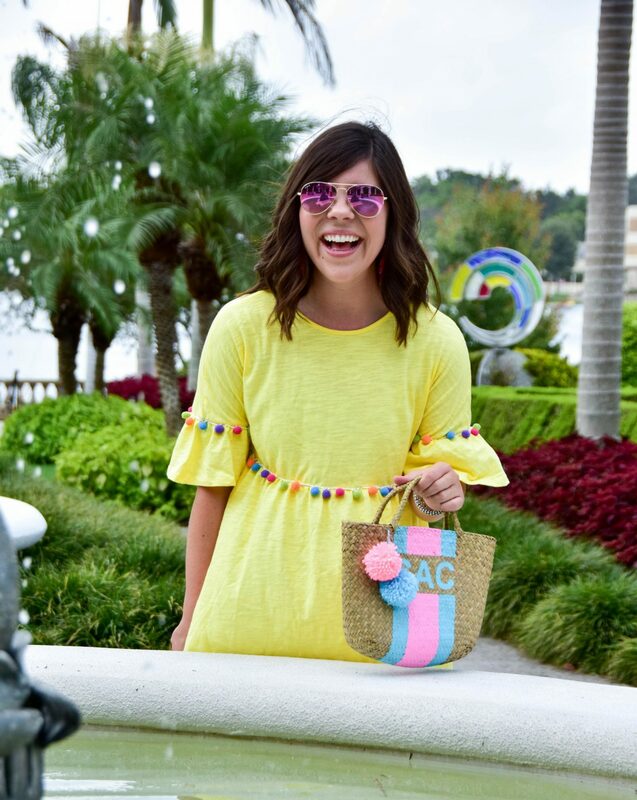 Pom poms are just so fun for summer!! Oh my gosh how cute is this look?! Absolute summer perfection!! 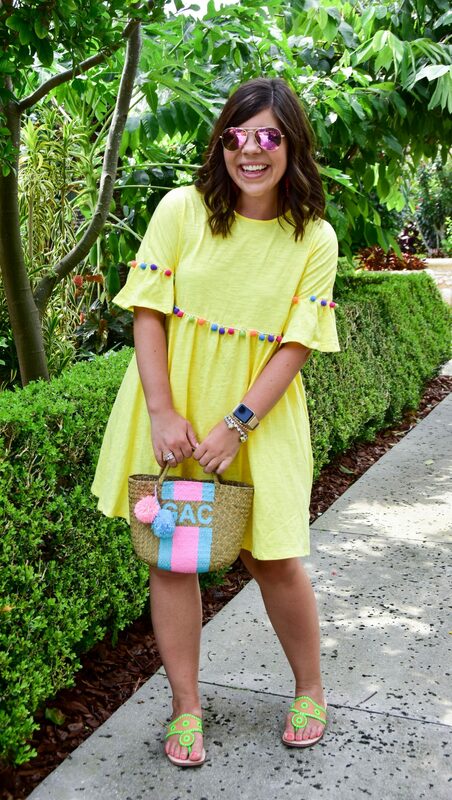 This is quite possibly the most summery, bright, and fun outfit I’ve seen lately! It made me SO happy just looking at those colors and poms! You’re adorable! That’s how I felt too- so so happy! How cute is this dress! 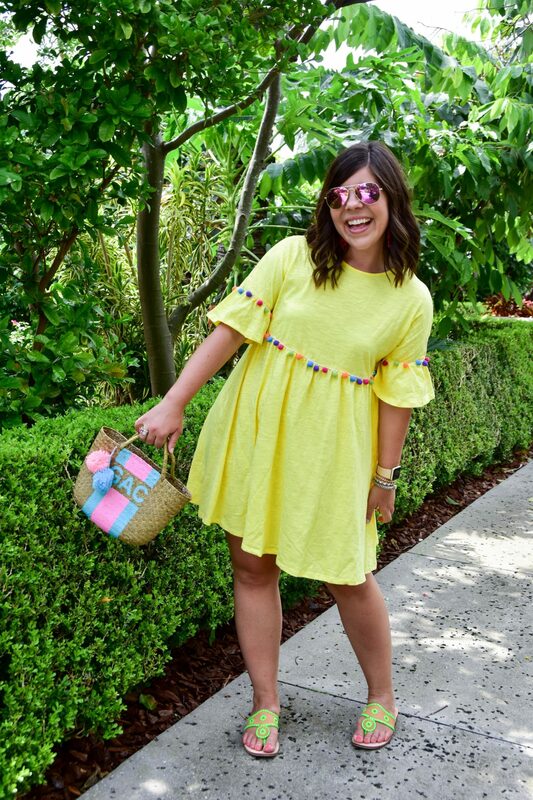 This is definitely a cheerful dress that makes me want to shake me bon bon! How darling is this little pom dress. Such a pretty color on you! Definitely singing that song in my head now 😛 .. love this color on you girl! So fun! Oh my gosh! This is such a fun outfit! I love all the cheery and fun details! 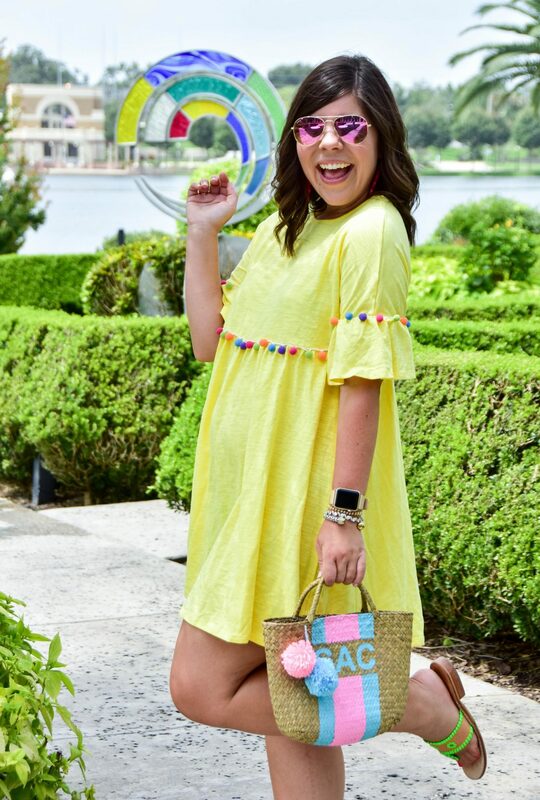 I can’t decide if I love the dress or the bag more!! You are too cute! 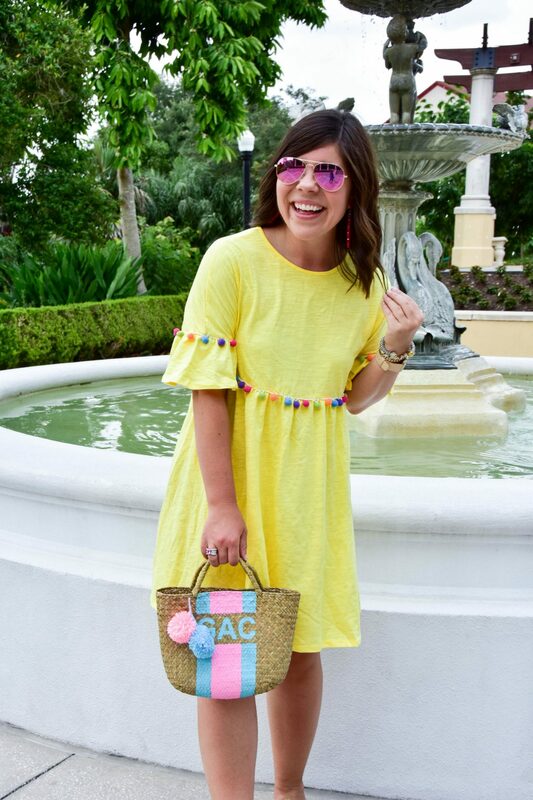 That is such a cute pom pom dress!! I love that bright yellow shade on you too. How cute are you! I love this dress! Ooh I’m checking this out right now! Thank you!